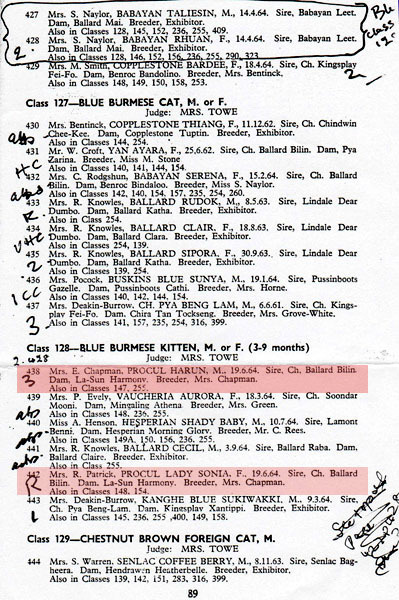 A few e-mails and 'phone calls to Maureen Smith and Margaret Somers at the Burmese Cat Club lead to me being put in touch with that august organisation’s Rosemary Hale. Over the 'phone, and later by letter, she tells me I’m not the first to have asked her about Procol Harum, though the last enquiry she received was a few years ago and didn’t seem to lead anywhere. With considerable patience and good humour, Rosemary explains the history of the Burmese breed in Britain, and provides me with much illuminating anecdotal and documentary information about the subject of my enquiry. The online database is a lengthy work in progress – cats breeding like … well, cats – and it turns out my quarry’s details have simply yet to be added. 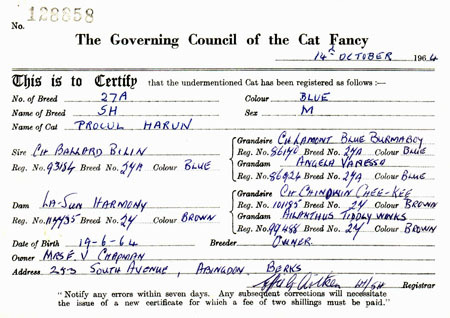 ‘The band Procol Harum was named after a Blue Burmese male cat named Procul Harun,’ confirms Rosemary, after consulting the registration document and pedigree certificate the Cat Club was bequeathed when the cat’s breeders died in the mid Eighties. So the band did have access to the genuine pedigree certificate, after all … they just didn’t take notes. Mrs Eleonore Vogt-Chapman and her husband were among the first to breed Burmese in Britain. (Eleonore was of Scandinavian origin, and Vogt was her maiden name.) 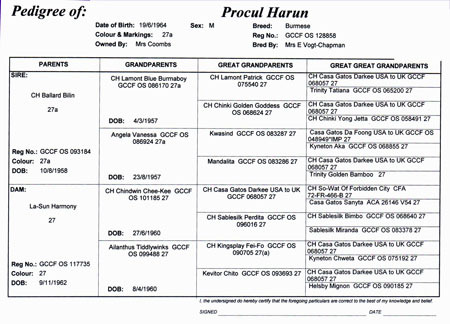 Different breeders register and claim sole use of a particular prefix, and the Chapmans used Procul for all their cats. 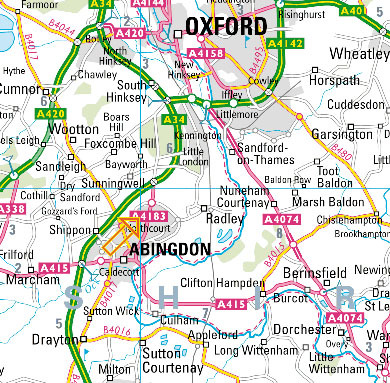 Various online dictionaries inform me that it is indeed Latin, and can be translated as ‘far away’ or ‘from a distance’, which is appropriate enough for a breed of cat that had already travelled to Britain from Burma via the USA. Given the wide variety of suffixes afforded the Chapmans’ cats, though, it would be a mistake to impose a Latin interpretation on their full names. 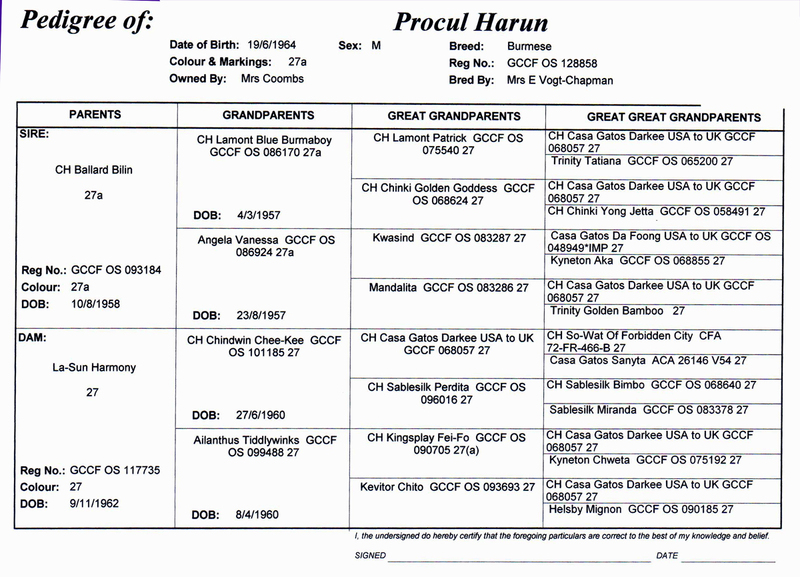 The other kittens in Procul Harun’s litter – his only full siblings – were named Procul Hussein and Procul Lady Sonia. All that the three suffixes have in common is a (very) vague nod to the breed’s Eastern origins and a tendency to flatter. Sonia is originally a Greek name meaning sensible or wise. Hussein is Arabic, meaning good, handsome or fair. Although the name Harun probably originated in Egypt, and – typically for anything associated with Procol Harum – is of unknown derivation, it is the Arabic version of Aaron. As Aaron was the older brother of Moses, the Hebraic interpretations of the name have held sway. Given the familial association with mountains, most are variations on a theme of loftiness and exaltation. Breeders were obliged to keep cats for at least three months before selling them. A scrawled note on the back of Harun’s registration document reads: ‘Mrs Coombs. 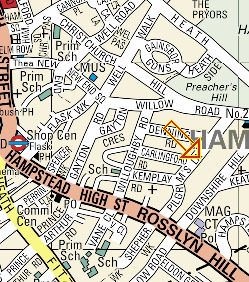 12a Worsley Road, Hampstead. Olympia. £10.’ From this it’s reasonable to deduce that a Mrs Coombs of that address first saw him at the National Cat Club’s show at London’s Olympia in December 1964, and became his new owner shortly afterwards. Rosemary Hale finds an annotated programme for the Olympia show among Mrs Vogt-Chapman’s papers. All three kittens from Harun’s litter were indeed shown. 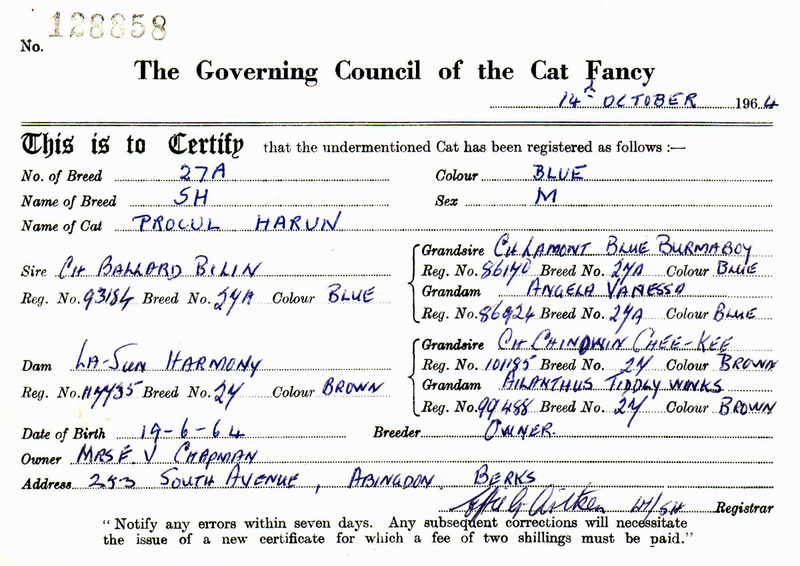 Harun himself, number 438, came a not particularly distinguished third in his class of kittens. The £10 Mrs Coombs paid for him is roughly equivalent to £140 today. There’s no record that she ever sold him on, so this suggests Mrs Coombs was probably still his official owner when the cat’s name was appropriated by the band in early 1967. Again typically for this investigation, Worsley Road no longer exists. 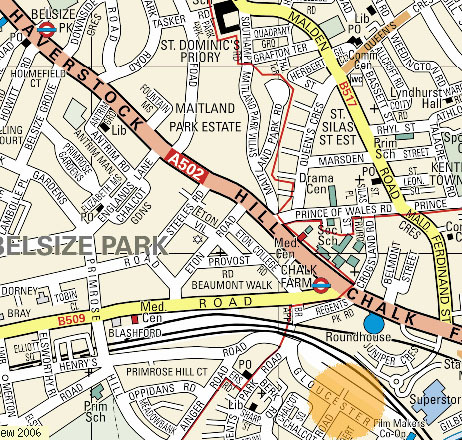 It was incorporated into Pilgrim’s Lane in 1969, at which point the houses were renumbered. Number 12a Worsley Road became 56a Pilgrim’s Lane. 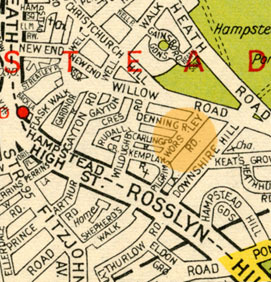 The address doesn’t appear to be likely roadie or drug dealer territory: politician Michael Foot was a Pilgrim’s Lane resident at the time, and still is. But the flat Guy Stevens shared with his wife Diane at 23c Gloucester Avenue, a popular party venue, was just a couple of hundred yards away down Haverstock Hill. ‘I was always told that Mrs Coombs was the mother of a Procol Harum band member,’ offers Rosemary Hale. While this isn’t the case with regard to the official early line-ups, numerous musicians auditioned for or were even briefly members of Procol Harum during Guy Stevens’s tenure as manager; and some of their names have been forgotten even by the core members of the band, such as the near legendary drummer known only as ‘Tubs Drubs’, despite having played on the demo of AWSoP. A connection of some sort via one of the musicians in the Procol-Stevens circle is at least theoretically possible, then. Googling different spellings of Coombs with various combinations of Procol Harum and Guy Stevens throws up one possible candidate: Rod Coombes. Coombes had drummed for Lulu’s backing group the Luvvers, then George Bean and the Runners, where he replaced future Procol Harum drummer BJ Wilson, and then briefly with another of Guy Stevens’ protégés, Spooky Tooth. A drummer. Mmm. It’s worth an e-mail, which eventually brings the following response: ‘Unfortunately, although I lived in Hampstead – that’s quite a coincidence isn't it? – I never had such a cat, sorry.’ Shame. For a tantalising couple of days, I’d allowed myself to think I might have traced not only the cat’s owner but also Mr Drubs himself. Though, thinking about it, Brooker and Reid would surely have remembered a Tubs-tabby twofer. Via the London Metropolitan Archives website, I pay for a check on the electoral rolls for 12a Worsley Road, 1965 to1969. In the two weeks it takes for the information to arrive, I put in a request to talk to Gary Brooker via the PR company handling the band’s fortieth anniversary back catalogue reissue programme on Salvo/Union Square. I also contact Roland Clare at 'Beyond the Pale' and ask him to pass on e-mail requests to talk to Keith Reid (though he doesn’t think much of my chances) and former Procol Harum organist Matthew Fisher. When I apprise him of my quest, and tell him I think I’m nearly there, Roland unintentionally takes some of the wind out of my sails. ‘I got 90% of the way there too, I think,’ he e-mails back. ‘But it was several years ago, and I didn’t write it up.’ Oh. It sounds very much like he was the last person to go knocking on the Burmese Cat Club’s door. Guy Stevens died in 1981. By cross-referencing information supplied by Mott the Hoople biographer Campbell Devine with current online directory information, I find a likely 'phone number for Guy’s widow Diane. Three separate attempts go straight through to the answering machine. I finally leave a message, but never receive a reply. There’s a thin line between dogged persistence and stalking, so I leave it. Covering all the other bases, I e-mail Ian Marchant to ask him about Ash. ‘It was quite early on when the band was named,’ recalls Gary Brooker over the 'phone from France. 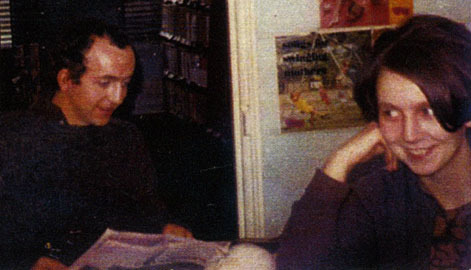 ‘I think it was when we were rehearsing in Camden, a church hall sort of place. Before we moved to Stockwell. I have a recollection of the name being suggested over the 'phone, but – come to think of it – why would there have been a 'phone there in those days? We didn’t expect so much interest in the name. It became another mystery. An enigma. I remember seeing the pedigree certificate. It was in a newspaper, I think.’ He doesn’t recall anyone called Coombs either. ‘I thought the cat owner’s name was Bob. Can’t remember his surname.’ Bob? Now we have a Bob? The electoral roll search for Worsley Road turns up no Bobs, but does reveal that Elisabeth A Coombs shared the flat at 12a with David Rhys-Rowberry. Given the times, this suggests a younger unmarried couple: Miss rather than Mrs Coombs, with her partner being perhaps the more likely link to the band. Although still at the address in 1965, they had left before the naming of Procol Harum. Googling variations of the then-partner of the other Elisabeth throws up another intriguing possibility: Dave Rowberry, who replaced Alan Price as organist in the Animals… one of several R&B bands with which Guy Stevens had a close relationship. Rowberry’s 18-month tenure in the Animals came to an end at the end of 1966, around the time Brooker, Reid and Stevens began looking for musicians to form Procol Harum, and before they found Matthew Fisher, so he might, conceivably, have tried out for the band around the time of its naming. Rowberry passed away in 2003. Checking the registration of his birth reveals no trace of ‘Rhys’, whether as a subsequently dropped double-barrel, a middle name, or a mother’s maiden name. This looks like a dead end. This ongoing article is © Marcus Gray October 2007, and is reproduced by his kind permission. In addition to an AWSoP retrospective for Classic Rock, Marcus Gray is the author of the sometimes-acclaimed Last Gang In Town: The Story And Myth Of The Clash, the occasionally-remembered It Crawled From The South: An R.E.M. Companion, and the deservedly-forgotten London's Rock Landmarks.